that combines crowdsourcing journalism and social media oriented information. It is a Social Content Network that changes the way people make “information”, making it more simple, multimedia, social and fair. 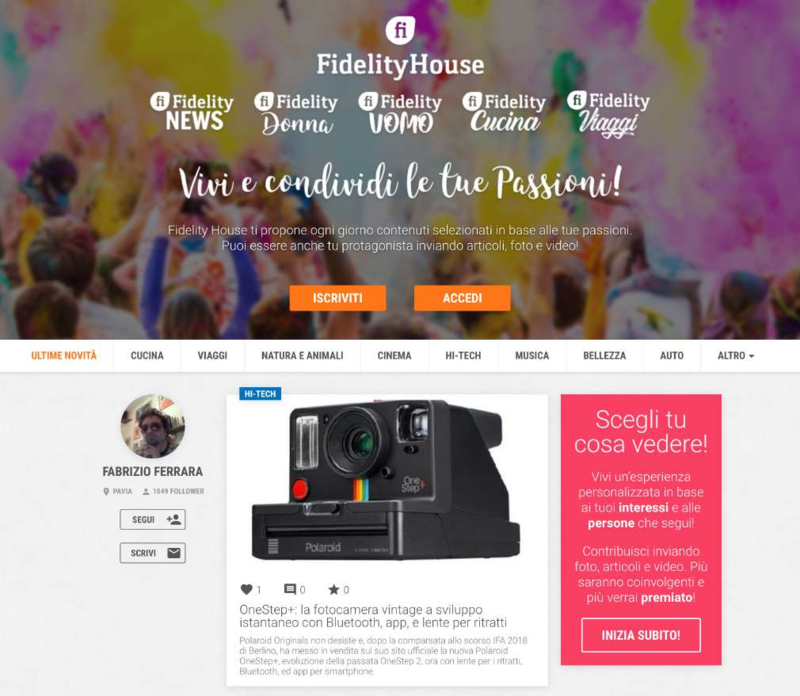 The consolidated experience of the italian project, born with zero marketing budget and become one of the leading websites in Italy, with 750 million page views per year and important recognitions, will make FidelityHouse one of the leading high-quality content aggregation sites worldwide as well. Taking advantage of the new technological paradigm it will be possible to make content lifecycle management fairer and more transparent, formalising and certifying the relationship between author and Publisher. FidelityHouse will be the first Publisher to choose this innovative approach, that takes advantage of the blockchain technology, as the basis of the editorial project, making it at the same time accessible to independent authors and third-party publishers through the services offered by FidelityHouse Chain. As early as 1996 Bill Gates understood the immense power of contents for web development, defining them as the means by which we can expect “most gains on the internet”. The relationship between “content creators” and “platforms” is definitely the weak point of the entire ecosystem, which treats customers as a “product” and in fact deprives them of the paternity of their contents. In FidelityHouse’s vision, authors must be owners of the contents they have created, that are and will become more and more the curriculum of the information society, in which competency and influence are “liquid assets” not relegated to limited professional categories.Whether they are photos, articles, guides, tutorials or recipes, contents are therefore an investment for the author, a real capital that guarantees, in addition to reputation and influence, an income over time and for this reason it must be certified and protected. For platforms and publishers even a “not professional” author is strategic: it is therefore necessary a new approach based on fairness and transparency to be able to attract and retain them. Emission rate New tokens will not ever be created. All the unsold tokens will be destroyed.